That Ouroboros moment when the last bag eats its mother. What kid wouldn’t get a thrill out of playing Air Raid Warden and cranking out 115 decibels of fun at the playground? This is my Uncle Fester payback for that tin-drum you bought my kid, the bow-and-arrow set that ended up embedded in the windowsill of the neighbor’s master bedroom. You know who you are. I’m coming for your sanity. Here, for your holiday shopping pleasure, is the Superior Airhorn company’s personal air-raid klaxon (with carrying bag). WARNING: This puppy is loud. I just blew my ear drums when I listened to a sample through my headphones at work. Yesterday colleague Bryan House (@bryanhouse) ended Acquia’s first customer conference, Engage, with a beer tasting demonstration. Everybody was served a flight of beers, a snack tray of two kinds of malt, some fresh hops and a few coffee beans. As a failed home brewer (my product made excellent slug bait around the zinnias and tomatoes), hearing a professional brewmaster talk about the factors that go into a great beer was a great education and excuse to quaff an Octoberfest, a local beer (Narragansett Autocrat Coffee Milk Ale) and a Dogfish 90-minute Imperial IPA. Tip of the hat to Uncle Fester for finding the best first paragraph of any Wikipedia entry. Ever. I would have loved to have handed these out in third grade to the other kids at the Perley Elementary School in Georgetown Massachusetts. Do little kids still do the cheap Valentine’s Day exchange? 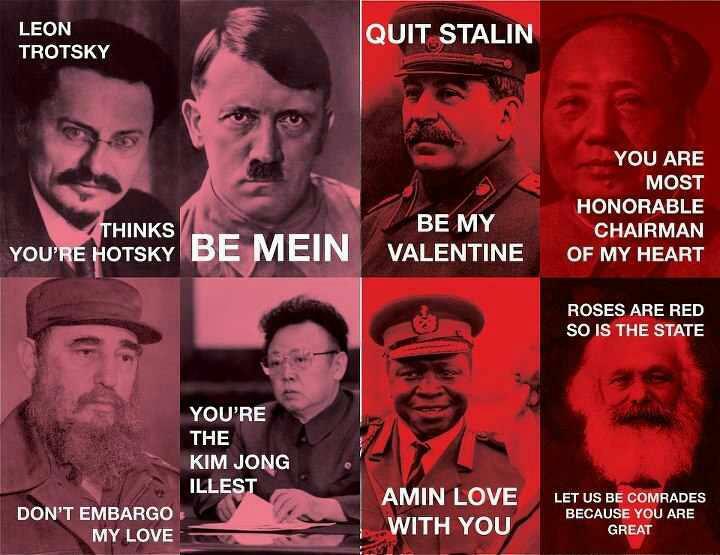 Anyway….it’s one of those days and I thought some Totalitarian Dictator Humor was in order. Click for a bigger view. I listen to a lot of ambient music during the day while I work — I’ve always listened to something in the background while writing — generally instrumental stuff streamed through Last.fm which I can tune out but which gets rid of the bleak silence of my office hereon the Cape or in Manhattan. I’ve noticed over the last six months a lot of music incorporates people speaking — not singing — fragments of everyday conversations over the music. This is not singing. This is talking. Thank god Last.fm has a “ban” button so I can banish this stuff forever. But I swear there’s more of it and it keeps coming. I give you “Little Fluffy Clouds” by The Orb. And finally, “Close Your Eyes and Daydream” by Obfusc. This one was the last straw and forced this rant out of me. Happy Festivus people. Imagine if some crazed Griswold on the cul de sac in your gated community one-upped the Christmas lighting arms race with this?